Rat extermination is a challenging task as brown (or Norway) rats are so quick-witted and watchful. They are famous for their neophobia. In fact, if they want to feed on something new, that smells differently from what they get used to, they make the weakest rat to sample. If you want to get rid of rats by using different traps, it is important to make this trap attractive and safe for the home pests at first. Use bacon, sunflower seeds, nut meat, peanut butter, or wheat acting as baits. Use live rat traps, snap traps and rat zappers, around the potential rat habitats and throughout the infested area. Place them in front of holes and cracks, along the baseboards and inside crawlspaces where rodents prowl about and enter the building. Beware and take measures to prevent non-target animals, domestic pets and kids from having access to the baits and traps. Conventional steel traps and wooden traps are designed for rat extermination by catching those that come to feed on the bait or simply run by. When the rattrap works successfully, the caught animal dies at once from a serious damage. However, in most cases, rattraps either end up with nothing or catch the rat’s pads. Unfortunately, the trapped pest suffers from pain and screams. You have to go in for kill the poor creature on your own. You may strike it by something hard, or pour boiling water, or throw a stone or brick. Indeed, this method of killing rats is an inhumane torture. On the other hand, cage rattraps don’t hurt the rodents, rat zappers electrocute at once. Thus, they are better to apply in this case. When you place rat traps in the infested areas, try to surround them with heavy boxes, jam jars, buckets with sand. This will stop the trapped rat to escape. Always keep the bait fresh. If you decide to get rid of rats using steel traps and wooden snap rattraps, it is recommended not to set them to catch for a couple of days or more. 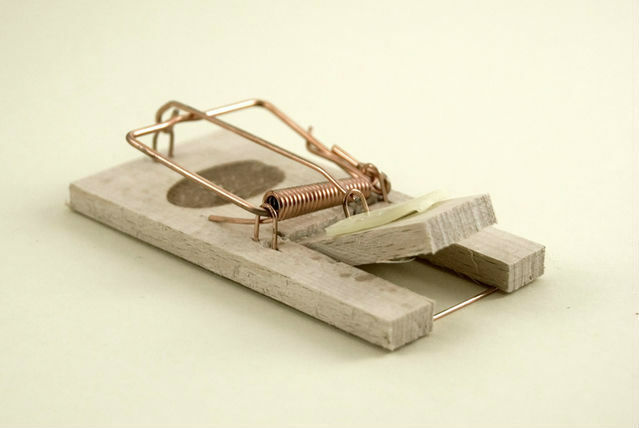 Simply place the rat traps flat on the floor and leave some treat for the pests on them. Seeds, nuts, bacon are ideal lures for rat extermination. It is necessary for the critters to get used to the new food source in their area and consider it to be safe. In some days, you should set many spring-loaded traps with hard bread or crackers ready to snap, and wait for some dead rats! Use protective gloves and dispose of the corpses into plastic bags. Then, put them into outdoor trash containers. In addition, the colony members, that are still alive, will stay away from the traps. Thus, you will have to use another method of rat extermination. Cage traps or live rat traps are designed to catch rodents on baits. Rats that get into typical cages stay alive. Thus, you may resque the rodent somewhere away from your home. Of course, it is comfortable when your appartment is free of rats. However, it happens that a rat enters your home to look for a meal from time to time. How can roof and Norway rats get into your dwelling? There are lots of ways how they do it. Rats gnaw through walls and pipes, they come via air vent systems, holes, open doors and windows. They may enter even through closestools. If you often have a night guest indoors, the best option is to catch a rat using a homemade rat trap. As a rule, homeowners buy special glue for rodents. As rats are larger and stronger than mice, it is necessary to apply the glue on something heavy (a tile, a blanch, a dalle). Use a thicker layer of glue than for mice traps. Then, place some peanut butter or bacon in the center of your homemade rat trap to lure the critters. Leave the sticky bait-loaded tile in the area where you’ve found the signs of rat presence. And… wait for the trapped. This method of rat removal is a safe, clean, non-toxic and reliable alternative to dangerous traps and chemical baits. High voltage electroshock kills the lured rat at once, while conventional traps and poisonous baits make the rodents suffer from starvation and die on the gridiron. Moreover, rat killers are designed safe to children and pets. Protection switch prevents mistake electric shock to human. Thus, electronic rat zappers can be widely applied in kitchens, dining-rooms, bedrooms, hotels, offices and any places where rats regularly enter or appear. If you want to learn about rat extermination by using chemical and non-toxic baits read here. The best way to get rid of rodents with traps is to use electronic rat killers. Immediate death and no torture. It is also important that they are the safest devices for rat extermination in houses with kids and domestic animals.